But I can understand if you love flaky traditional. Pies in the skies and stars in my eyes. Match dot com strikes again! If we posit that love between humans (or among for you pervs) is something beyond these cold material things, beyond sexual attraction, then why hesitate when it comes to animals? Idk! People weird things is my best guess. If you’re wondering whether I answered the question in this jabberish, that’s fair. I hedged. I say if there is a thing we’re defining as love for humans, then all higher animals should not be excluded from the circle. But I am an atheist and, despite my poetry (and even my latest fictional WIP) which can careen into the woo to better illustrate emotions, I don’t believe in souls, soul mates, eternal flames, fate, or anything of that nature. Like Fandango, I’m already breaking my own rules and playing a game instead of writing, aka lying. Blame Rory and his Daily Fun Three. Three of your childhood books? Three of your best memories? Things that are yellow and triangular? Wishes you would like to be granted if you had a magic genie lamp? Beautiful places you have ever visited? Things you fall back on to make you feel better when having a bad day? Things that best describe your family? Things you would choose if you had ten minutes in your favourite store if you didn’t have to pay for them? Dishes you can cook in less than 15 minutes and ready to eat direct from serve? Bird species beginning with the name G? Of your most favourite letters from the alphabet? Of the most boring things you have ever done? Questions you would ask of your pet if you could? – why are you so yowly, why don’t you bury your p00ps so our enemies won’t find us, why can’t you let me smoosh you when I’m cold??? Of your favourite cartoons from now or when younger? Of the emoticons you use the most when writing or in social media or comments? Every year, the folks at the soup kitchen lined up for their Thanksgiving meal. They were very grateful for a warm place to spend the afternoon, along with wholesome food to fill their bellies. Most of them were used to cold and hunger, especially at this time of year. The three friends ate and talked and kept debating which of the pleasant folks at the soup kitchen brought the pies, but none of them had noticed the unsmiling man standing discreetly outside the door, providing security. Yes, it was none other than retired police lieutenant and pastry baker extraordinaire, Stan the Pie Man! If so when do you start decorating for Halloween? – I don’t decorate at home, but I do make my workspace a bit festive with some shrunken heads n stuff. What types of candy/sweets do you buy for the Trick and Treaters who may come calling? – Sadly, no kids come around. Their moms must have heard the rumors about me. – If I’m going to an event, definitely. I love costumes. Fake blood or not into that kind of thing? – Nahhh. Not into gore. More into funny or clever type costumes. Do you wear a costume to work, or is that frowned upon? – They wouldn’t care, but I wouldn’t be comfy in one for the whole day in an office. If so, what did you go as last year? – Just a kitty shirt/black pants. Have you already bought some halloween decorations? What was the original name for Halloween? What do people typically carve at Halloween? Why were people suspicious of black cats during the Middle Ages? – Ignorance. Black cats rock! What fruit is used to play a traditional “bobbing” game at Halloween? Why did people traditionally dress up in costumes on Halloween? – To escape from the Czar, probably. Who first celebrated what we’ve come to know as Halloween? Name the TV series in which Samantha could perform magic by twitching her nose? – I Dream of Jeannie. Which ‘witch’ had a hit song in 1970 with ‘That same old feeling’? Okay! What did I win??? Q1] Favourite all time creepy monster or villain? – Rather partial to Johnny Depp’s Barnabas Collins. Q2] Pumpkin Pie or what is your favorite pie at Halloween? – I didn’t know we were supposed to eat pie at Halloween ~ I’ll get right on that! Pumpkin sounds good to me, iff it has a graham cracker crust. – Not really, but I’m not opposed to it. – Not seriously, but you have to make decisions somehow in a world full of chaos, so having “lucky numbers” and that kind of nonsense isn’t the worst thing unless you do actual harm. Forex, I like to buy 8 things at a time, not 7 or 9. If I have 9 things, I’ll add Tictacs to make 10. – I don’t know what that is, so no. Q10] So it’s dark and creepy, and you have just been dared to visit the local Cemetery would you do it? – No, but not because I’m afraid of ghosts ~ because I’m afraid of humans who might be hanging out there doing drug deals or whatever. – I have to leave the lights on! – Monster Mash, Spooky, Rhiannon, Witchy Woman, Bad Moon Rising. Q13] Favorite all time scary creepy spooky book? – Stephen King’s The Shining. – Little Red Writing Hood. – Probably the Saturday before but not on the actual day. – White cakes with red jello drippings all topped with swirls of fleshy pink frosting! – My mom and I watched Creature Features in our basement while doing jigsaw puzzles. Saw all sorts of horrible things: monsters ripping off heads in ski lodges, reptiles taking over Florida, beasts eating sailors on submarines, etc. Movies (and books) were never censored for me, which is probably not the best way. BECAUSE NOW LOOK. – I can talk myself down from fictional scenes. People are another matter entirely. Anyone who isn’t terrified of the current U.S. gov’t right now is not paying attention. Q21] It’s Halloween, you have three choices which do you pick? Party, Trick or Treating or staying at home curtain closed watching spooky stuff? – Dismantling the patriarchy. I mean party. Damn autocorrect. Searched the cars for eclairs. Someone was cooking with spice. I had found my snack for tonight. I heard the oven bell. She said how about some noodles? I spied a hidden chocolate pie shell. All in honor of PJ! Much of my stress/anxiety has always come from the struggle to carve more freedom for myself. This is a bit ironic, since I like structure and routine, don’t mind rules as much as some people, and have desires that require funds, which necessitates an income/job. Having a job, no matter how good it may be, takes a big bite from the freedom pie. Mmmpie! Yet I’m reminded of The Matrix, where at first people were given everything they desired ~ this supposedly bored them to the point where their brains quit producing enough energy. I realize this is fiction, but even so. A little stress and conflict may be good for us? Personally, I prefer the stress of a particularly difficult logic puzzle rather than an argument with another person, but YMMV. I guess I like the kind of anxiety I can control myself ~ I set my own pace in a pencil puzzle, but other people are too hard to predict. I read a couple romance novels recently and liked them both a lot. The first was As Hard As It Gets by Laura Kaye. There were many good things about this book, including great chemistry between the protags, something different in that the hero was a skilled tattoo artist (even though of course being a supertough ex-military dude), and fun side characters. I loved the hero’s brother ~ great sibling banter between them. There was also a bunch of funny banter among the military buddies. I did have a couple minor issues with this book. The first was the meaningless addition of a stray three-legged dog ~ we already know the heroine is a caring, warm-hearted nurse. There was no reason to toss in the dog to bring this out. It felt completely arbitrary. And what’s with these missing-limb pets lately? They even thought of naming it Tripod! Gah. I also read Irresistible by Susan Mallery. This was a perfect romance novel; everything was exactly right. The main characters were good peeps with trust issues, and the slow untangling of those made for a great read. The side chars were interesting in their own right, and some also have their own novels, yay. I will probably be buying one or more of those, and possibly other books by Ms. Mallery. Irresistible had a very simple plot structure and no glaring over-complications thrown in at random. It skirted the edge of believability at times, such as with the meanness of the hero’s grandmother, but never crossed over. OK, one thing. Irresistible had a gorgeous pink cover with a pic of a cupcake on it ~ gosh, I wonder if this influenced me to buy the book at CVS in the first place? But there are no cupcakes in the book, not one. The heroine baked a pie for the hero after he fixed her car and there were lots of other food incidents, but no frosting. I still gave the book 4 stars on Goodreads because I loved it, but really is it so hard to have covers that go with books? The worst are the covers of old where the hair color is wrong. Nothing worse than buying a novel with a pic of a swooning redhead in a pirate’s arms… only to find out she’s really a blonde. 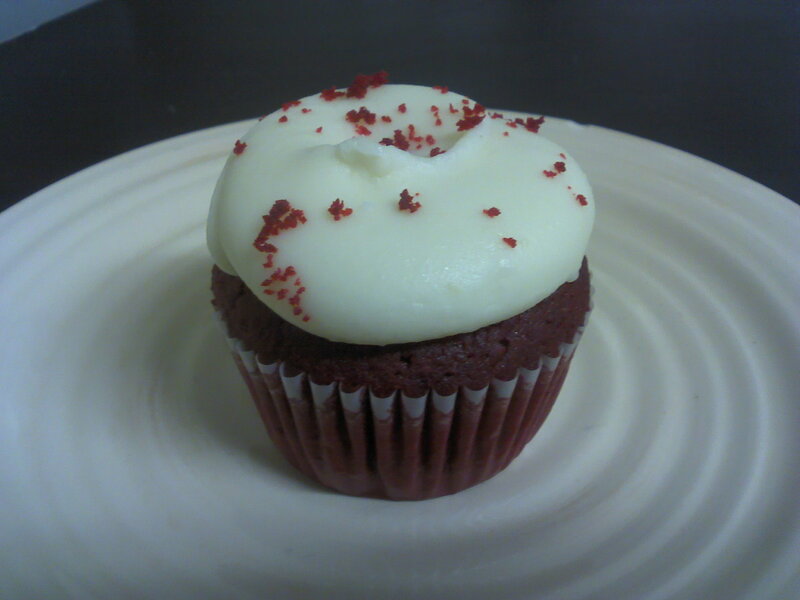 As promised, I have tried a new cupcakery ~ and it’s right in my town of Huntington Beach. Not only that, but it’s almost next door to the place where we have our writers’ meetings every other week. Bubba Sweets has kind of an over the top feel, both online and on-site, but that’s okay. They all can’t be Sprinkles. And the price is cool ~ $3 per cupcake or a great deal on 6 for $18. Hey, do the math. First I tried a vanilla/vanilla, pictured above. See what I mean? Too much pink, even for me. And there was no need for the cinnamon candy deco. The cake was super-tasty though and not oily at all, just moist and delish. The frosting was buttercream (yay!) and a perfect texture/taste combo with that little snap. The sprinkles were a nice touch. 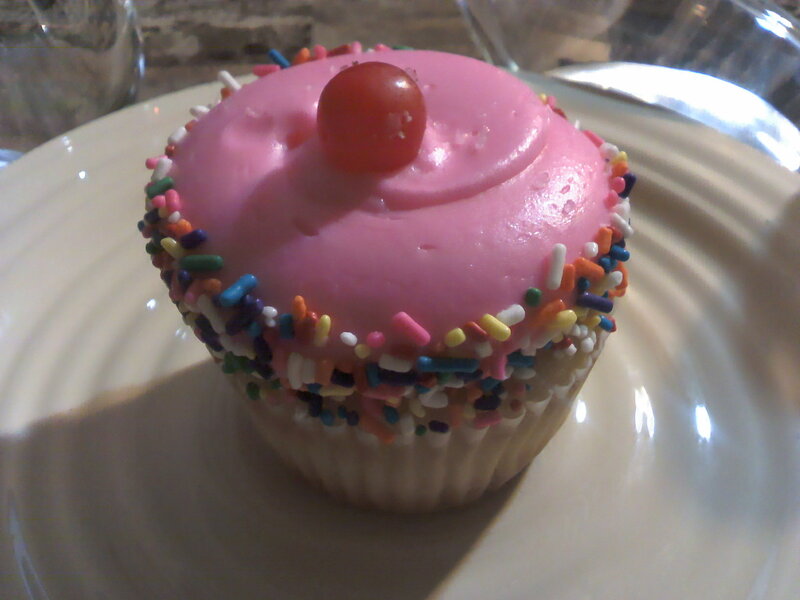 Great cupcake. Next I tried this complicated mango concoction. 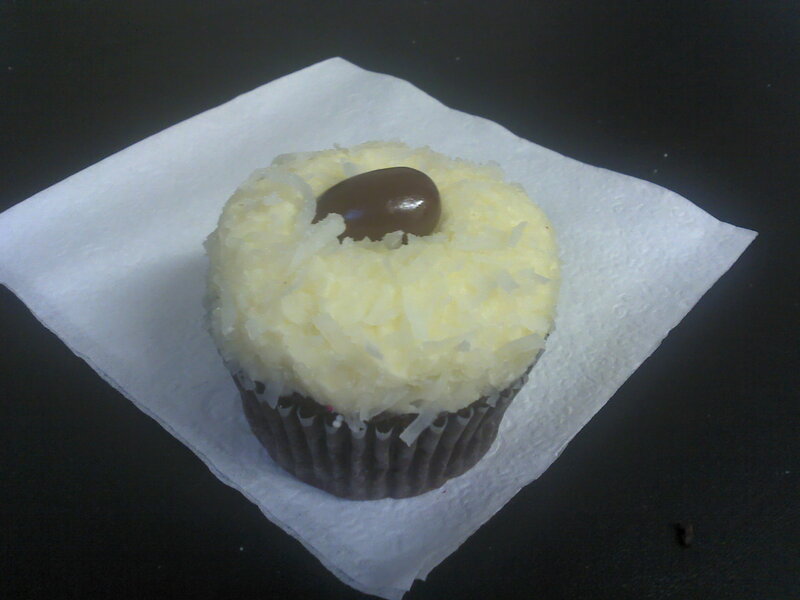 First let me state that this cupcake had maximum curb appeal, possibly the prettiest cupcake I’ve ever seen. The thing is a freaking work of art! And the cake was simply heaven. HEAVEN! There was a graham crust to die for. The cake itself was dense and rich and nom. Then there was a blob of (NO LIE) cheesecake filling. Omg yummy! But then idk what happened ~ some doofus decided to use whipped frosting. It had no texture, no snap, was just total soft mush. Yucky. The flavor was full of tangy mango goodness, but even so. The (lack of) texture ruined the frosting experience. Plus those seashells? Adorable but they tasted like plastic. This is one case where you’re gonna hear me say: give me the cake and hold the frosting. I saved “Coconut Bliss” for last. It had chocolate cake that went stale, as noted above (36 hours after purchase) and a choccy filling that was tasty. The frosting however ~ omg WOW! Wonderful buttercream with a super-rich flavor and loads of sweet coconut. I would have loved this frosting on the vanilla cupcake OR OR OR !!! 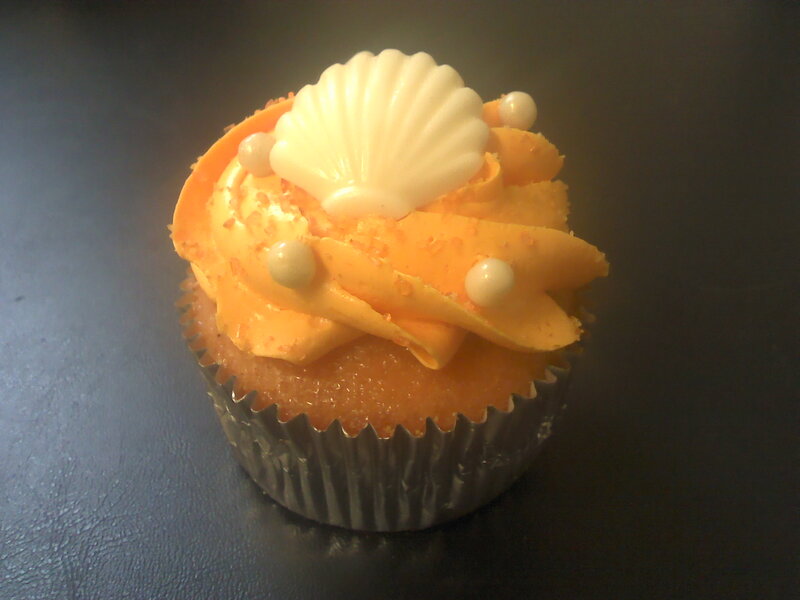 THE MANGO CUPCAKE WITH THE COCONUT FROSTING. Enough said. I think the idea is “out there” now. Well, anyway. You can’t tell me that some silly old triangle of pie could be this interesting. No, not even with ice cream. Just not going there with you. I may return to Bubba’s to try a couple other flavors, but I’ll need to go on a different day because like many cupcakeries, they do same flavors/same days. I have to say though that places like Sam’s Club are giving bakeries a lot of competition because it’s tough to want to shell out $3 for a cupcake when you can get 4 for $5 and they are many times just as good.